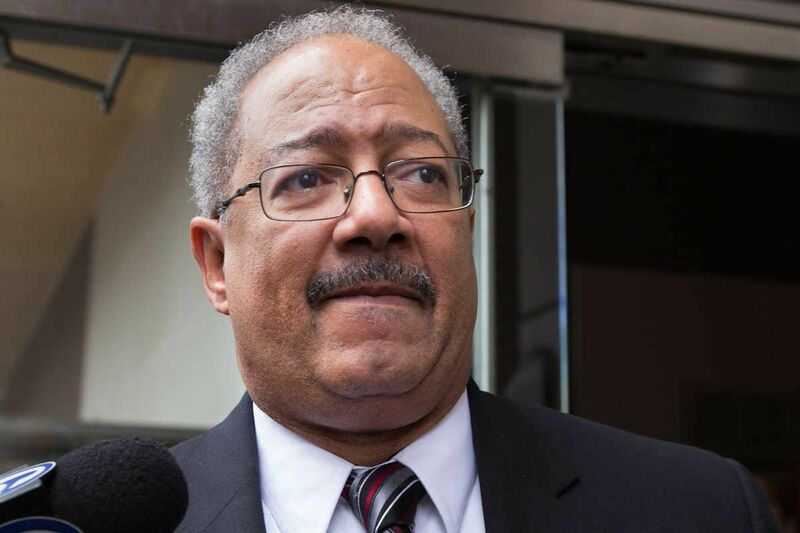 Former U.S. Rep. Chaka Fattah exits federal court after being sentenced to 10 years in prison Monday. The 10-year prison sentence handed down Monday to former Congressman Chaka Fattah for stealing from an education nonprofit to pay off a campaign debt should make the Philadelphia Democratic Party realize that it has become an incubator for corruption and needs to undergo dramatic change. The party should have gotten that message when former Democratic State Reps. Michelle Brownlee, Harold James, and Ronald Waters, and former traffic judge Thomasine Tynes were convicted in a bribery investigation, while former State Rep. Louise Williams Bishop pleaded no contest in the case. The party should have gotten that message when it was revealed that an ongoing FBI investigation that's apparently looking into the conduct of powerful electricians union head John Dougherty is also scrutinizing documents belonging to Mayor Kenney and Councilman Bobby Henon. But with Fattah preparing to spend time behind bars, several prominent city Democrats pleaded for U.S. District Judge Harvey Bartle III to go light on him. State Sen. Vince Hughes, Councilman Curtis Jones Jr., and Councilwoman Blondell Reynolds Brown should be more focused on restoring the people of Philadelphia's faith. Fattah's 10-year sentence and order to pay $600,000 in restitution may seem harsh to some for a nonviolent, white-collar crime. But the judge could have followed the prosecution's recommendation for an even longer sentence. And Fattah, who hasn't admitted guilt, is expected to appeal. His fall is a disappointment to all who remember him as the young politician who in the 1980s presented himself as different from the uncaring hacks who had run the city for so long. He was a policy wonk who wanted to fix American cities and help children attain good educations. And he did. But a failed mayoral campaign in 2007 saw Fattah take money from an illegal source and try to cover up the misdeed with a convoluted scheme that involved a nonprofit he created. Democrats coming to Fattah's defense need to put emotional ties aside and understand what their actions say about their priorities. Just a month ago, their seemingly bewildered chairman, U.S. Rep. Bob Brady, couldn't muster the will to oppose the candidacies of a state senator under indictment, a state representative facing trial, and an admitted felon. Democrats were mum when District Attorney Seth Williams belatedly disclosed $160,000 in gifts as he seeks reelection. Their silence signals tacit approval of the slime politics that has seen seven judges, a state senator, and five state representatives plead or be found guilty of corruption charges in the last three years. Meanwhile, Republicans, content with whatever crumbs fall their way with the Democrats in charge, have barely made a peep. They don't even run candidates in some of the Council and state legislative races. When they do have decent candidates, they don't support them. Fattah is the latest politician to be convicted of betraying the people of this city. But he's not the only one who should be awaiting judgment; if not in a courtroom, then at the polls. The public must show they mean it in insisting that elected officials clean up city politics or be replaced.